CSOM has traditionally been classified into safe ear disease and unsafe ear disease. Safe ear disease, sometimes called tubotympanic disease, is characterized as a central perforation of the pars tensa with the inflammatory process affecting the mucosa of the middle ear cleft. Unsafe ear disease, sometimes called atticoantral disease, is typified by a marginal perforation of the posterosuperior pars tensa or pars flaccida. Cholesteatoma is frequently present in CSOM with posterosuperior perforations. Partially due to induced bony erosion and secondary infection, cholesteatomas can lead to potentially devastating sequelae. Admittedly, all cases of CSOM, including those described above as safe, can be associated with serious intracranial complications. Therefore, the term safe does not adequately categorize any cases of CSOM. CSOM can be more simply divided into mucosal disease and cholesteatoma. Mucosal disease is typified by a bacterial infection of the middle ear cleft with the presence of pus, associated with discharge through a pars tensa perforation, for longer than 3 months. Acquired cholesteatoma, usually arising from the pars flaccida skin, typically involves the epitympanum and the mastoid antrum and, as stated above, can be erosive, causing serious complications. The following image depicts the middle ear. The ciliated, pseudostratified columnar epithelium of the respiratory tract extends up the eustachian tube as far as the anterior part of the middle ear cavity. Because of the presence of goblet cells and mucus-secreting glands, this epithelium is capable of mucus production. More posteriorly, the mucosa changes patchily into a simple cuboidal or stratified epithelium with no secretory elements. The medial aspect of the tympanic membrane and the mastoid air cells are lined by a single layer of cells that range in shape from cuboidal to flat. In the early stages of inflammation, regardless of cause, vasodilatation of the submucosal tissues occurs. Glandular secretion is stimulated with the production of a thin mucoid fluid. Some epithelial cells die, and bacteria that are usually in the area multiply in the denuded areas and aggravate the condition. The neutrophils in the blood cause a polymorphonuclear reaction, resulting in a mucopurulent discharge. This discharge may remain stagnant within the middle ear and the mastoid air cell system because of immobility or loss of the cilia, including those in the eustachian tube. Resolution frequently occurs, but, if the condition is prolonged for some reason, such as the inability of the secretions to drain down the eustachian tube, the number of glands and goblet cells increases, and the areas formerly covered by a cuboidal or flat epithelium change into areas of a similar but perhaps less well-differentiated pseudostratified columnar epithelium. Differentiation into squamous epithelium, most frequently nonkeratinized, can also occur. Granulation tissue results from the nonresolution of an inflammatory process. Localized areas of the mucosa become hyperplastic with invasion of fibroblasts, capillaries, macrophages, plasma cells, and lymphocytes. Granulation tissue can be covered by all the mucosal types described above, but, because the tissue is frequently ulcerated, it does not have a mucosal covering. Anatomical considerations also contribute to the pathophysiology of middle ear diseases. 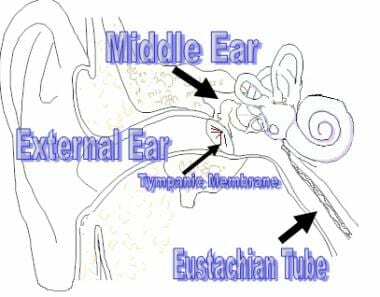 The eustachian tube is important in pressure regulation of the middle ear, protection from nasopharyngeal sound pressure and secretions, and clearance (into the nasopharynx) of secretions produced within the middle ear. The eustachian tube has been found to be highly compliant in infants and young children, providing the eustachian tube with an abnormal patency. Greater patency of the eustachian tube allows not only gas to readily flow from the nasopharynx into the middle ear but also easier access for unwanted secretions from the nasopharynx. This increases the likelihood of infection. The length of the eustachian tube is another key anatomical consideration in the pathogenesis of middle ear inflammatory disorders. The shorter the tube, the more likely secretions can reflux into the middle ear. For instance, young children with a cleft palate and those with Down syndrome have eustachian tubes that are statistically shorter than those of age-matched controls younger than 6 years, which may explain the frequent occurrence of troublesome otorrhea in these populations. Various interleukins are of particular importance in otitis media. An example of the recent ongoing work in this field is the discovery that the bone-resorbing activity of cholesteatoma with chronic otitis media may be attributed to interleukin-1 α (IL-1 α). The Center for Disease Control (CDC) showed that otitis media was the principal diagnosis for 12% of ambulatory-care visits provided to children younger than 15 years. A study of cholesteatoma in the United States revealed an incidence of 6 cases per 100,000 population. Within this population, cholesteatoma was most common in children aged 10-19 years, with an incidence of 9.2 cases per 100,000 population. Over the last 20 years, the incidence of AOM increased by 68% in Finland, while that of repeat AOM increased by 39% in the United States. In developed countries, the current prevalence of secretory otitis media (SOM) is 20% in infants. In the United Kingdom, the incidence of active CSOM in the adult population was reported to be 0.6%. An Israeli study estimated the annual incidence of CSOM in children (birth to age 15 y) to be 39 cases per 100,000 population. Since the advent of the antimicrobial era, the mortality rate associated with complications of middle ear inflammatory disorders has dramatically decreased. The mortality rates associated with otitis media and mastoiditis decreased from about 2 per 100,000 persons in 1936 to less than 0.01 per 100,000 persons in 1976. The 2 most common complications of suppurative otitis include mastoiditis and facial paralysis. In developing nations, these complications remain relatively common because of the lack of adequate primary care. According to studies in developing countries, the rate in some communities was as high as 33% for perforation of the tympanic membrane, 6% for otorrhea, and 5% for mastoiditis. Cholesteatoma, atticoantral mucosal disease, and acute suppurative otitis media cause complications by spread of infection. Extracranial complications include chronic otitis externa and meatal stenosis, ossicular discontinuity due to ossicular erosion, middle ear adhesions, tympanosclerosis, otosclerosis, mastoid tip (Bezold) abscess, lower motor neuron facial nerve palsy, serous or purulent labyrinthitis, petrositis, Gradenigo syndrome, and labyrinthine fistula. All of these represent significant morbidity to the patient. American Indians and Canadian Inuits have a strikingly high incidence of acute suppurative otitis media. In children of African and Australian Aboriginal origin, middle ear infections are more commonly severe. African American children seem to have fewer episodes of middle ear infections than American white children. CSOM suppurative otitis media without cholesteatoma is extremely common in certain racial groups, including American Indians, Canadian Inuits, Alaskan Inuits, Australian Aborigines, and New Zealand Maoris. In racial groups with a high incidence of central tympanic membrane perforations, such as North American Inuits and Australian Aborigines, cholesteatoma is relatively uncommon. In most studies on the incidence of acute suppurative otitis media, little difference exists between males and females. AOM falls into 2 distinct age groups; it is more common in the younger group (0-5 y) than in the older group (5-11 y). By age 6 months, about 25% of all children have had 1 or more episodes of AOM. At age 1 year, this figure rises to 62%; by age 3 years, to 81%; and by age 5 years, to 91%. After age 7 years, the incidence declines. The combined results of selected published studies on CSOM showed a bimodal prevalence curve with peaks of 20% at age 2 years and 15% at age 5 years. Cunningham M, Guardiani E, Kim HJ, Brook I. Otitis media. Future Microbiol. 2012 Jun. 7(6):733-53. [Medline]. Stol K, Diavatopoulos DA, Graamans K, Engel JA, Melchers WJ, Savelkoul HF, et al. Inflammation in the Middle Ear of Children with Recurrent or Chronic Otitis Media is Associated with Bacterial Load. Pediatr Infect Dis J. 2012 Jun 4. [Medline]. Marom T, Nokso-Koivisto J, Chonmaitree T. Viral-Bacterial Interactions in Acute Otitis Media. Curr Allergy Asthma Rep. 2012 Sep 12. [Medline]. Seo Y, Nonaka M, Yamamura Y, Pawankar R, Tagaya E. Optimal control of asthma improved eosinophilic otitis media. Asia Pac Allergy. 2018 Jan. 8 (1):e5. [Medline]. [Full Text]. Iino Y, Nagamine H, Kakizaki K, et al. Effectiveness of instillation of triamcinolone acetonide into the middle ear for eosinophilic otitis media associated with bronchial asthma. Ann Allergy Asthma Immunol. 2006 Dec. 97(6):761-6. [Medline]. Hurst DS. The role of allergy in otitis media with effusion. Otolaryngol Clin North Am. 2011 Jun. 44(3):637-54, viii-ix. [Medline]. Coughlin L. AHRQ data on antibiotic use in children with otitis media. American Family Physician. June 2005. Tong S, Amand C, Kieffer A, Kyaw MH. Trends in healthcare utilization and costs associated with acute otitis media in the United States during 2008-2014. BMC Health Serv Res. 2018 May 2. 18 (1):318. [Medline]. [Full Text]. King LM, Bartoces M, Hersh AL, Hicks LA, Fleming-Dutra KE. National Incidence of Pediatric Mastoiditis in the United States, 2000-2012: Creating a Baseline for Public Health Surveillance. Pediatr Infect Dis J. 2018 Mar 27. [Medline]. Vayisoglu Y, Gorur K, Ozcan C, Korlu S. Unusual complication of otitis media with effusion: facial nerve paralysis. J Craniofac Surg. 2011 Jul. 22(4):1525-7. [Medline]. Browning GC. Medical management of chronic mucosal otitis media. Clin Otolaryngol Allied Sci. 1984 Jun. 9(3):141-4. [Medline]. Dubey SP, Larawin V, Molumi CP. Intracranial spread of chronic middle ear suppuration. Am J Otolaryngol. 2009 Mar 31. [Medline]. McCormick DP, Jennings K, Ede LC, Alvarez-Fernandez P, Patel J, Chonmaitree T. Use of symptoms and risk factors to predict acute otitis media in infants. Int J Pediatr Otorhinolaryngol. 2016 Feb. 81:55-9. [Medline]. Miura T, Matsubara A, Kudo N, Hara R, Takahata J, Sasaki A. The expression of thymic stromal lymphopoietin in patients and animal models with eosinophilic otitis media. Acta Otolaryngol. 2018 May. 138 (5):447-51. [Medline]. Sakulchit T, Goldman RD. Antibiotic therapy for children with acute otitis media. Can Fam Physician. 2017 Sep. 63 (9):685-687. [Medline]. [Full Text]. Rosenfeld RM, Shin JJ, Schwartz SR, et al. Clinical Practice Guideline: Otitis Media with Effusion (Update). Otolaryngol Head Neck Surg. 2016 Feb. 154 (1 Suppl):S1-S41. [Medline]. [Full Text]. Frellick M. Otitis Media: New Guideline Includes Screening At-Risk Kids. Medscape Medical News. 2016 Feb 4. [Full Text]. Barclay L. Postop Tympanostomy Tube Obstruction Common. Medscape Medical News. Jul 2014. [Full Text]. Conrad DE, Levi JR, Theroux ZA, et al. Risk factors associated with postoperative tympanostomy tube obstruction. JAMA Otolaryngol Head Neck Surg. 2014 Aug 1. 140(8):727-30. [Medline]. Balbani AP, Montovani JC. [Impact of otitis media on language acquisition in children]. J Pediatr (Rio J). 2003 Sep-Oct. 79(5):391-6. [Medline]. The authors and editors of Medscape Drugs & Diseases gratefully acknowledge previous authors Nasir Aziz, MD, MA, Resident Physician, Riverside Regional Medical Center, and Sanjeev Silva, MBBS, MRCS, DLO, Senior House Officer, Department of Otorhinolaryngology, Head and Neck, Facial Plastics, Great Ormond Street Hospital for Sick Children, UK, for their contributions to this article.